Why should the boys have all the fun? The time has come for the Hens to get involved in the craze that is sweeping the nation. Bottles of Pink Bubbly are presented at the end of the games so you can toast the hen while reliving the highlights of your laughter filled event. Fancy dress is always encouraged and a hunky referee will be on hand to make sure you are not getting up to any mischief...so beware! 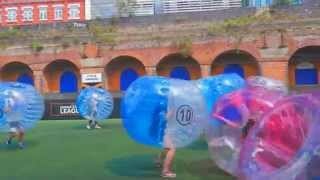 View our Bubble Mayhen £25 video and get an idea of what to expect on this activity.